There's something about this time of the year and apples. They seem to go hand in hand; crisp air, crisp apples. My co-worker Matt and I were talking food yesterday (so what's new?) and it reminded me of this recipe that he gave me a while ago. It seems like we all get stuck in neutral every now and then when it comes to making dinner. Same old, same old. When I was growing up, depending on what night of the week it was, you could bet on what dinner was going to be. That's just the way it was. Today, with the internet, the options are endless. You don't have to run out and buy a cook book to come up with new ideas. In a large skillet, heat the olive oil over medium-high heat. Add the onion, apples and sage. Saute until softened. Remove from the heat and gently stir in the bread, egg, butter and salt and pepper. Add the chicken broth gradually until everything is moistened. Let the stuffing mixture cool completely before putting it in the pork loin. Spoon the stuffing down the pork, horizontally, in a line. 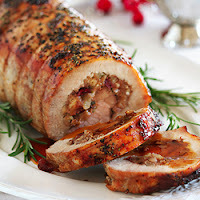 Roll the pork over the stuffing, jelly roll style, ending with the seam down and fat side up. Lightly score the fat, in a diamond pattern, with a sharp knife. Tightly tie the pork roast up with butcher's twine, season it with more salt and pepper, and transfer to a roasting pan. Roast the pork in a preheated oven for about 90 minutes or until an instant-read thermometer registers 160 degrees F. Remove from the oven and let rest for 15 minutes before slicing. Garnish with apples and fresh herbs. **Shh! Don't tell Matt but I like to add a tablespoon of brown sugar when sautéing the apples. Sometimes, I get a little crazy and pour a little apple juice over the roast before cooking, too.